Yes, I tried to abstain from a small political rant here, but I can't. 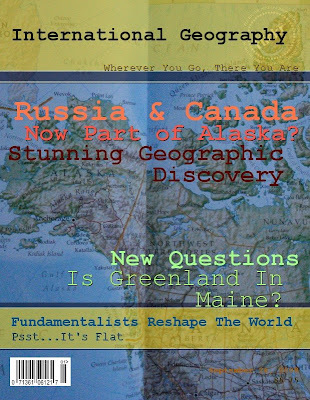 Not after learning suddenly that both Russia and Canada are now part of the state of Alaska!? Slap my head and call me stupid! Feelin' stupid? See for yourself. Hmmmm..... she's brilliant, isn't she? Anet, I just added a photo...couldn't resist. Woooo Hooooo -- Go Amy! This is fantastic!! I was so thrilled to read/hear some of this yesterday, 'cause I sure am hoping the gig is up! Haha, it took me a minute to figure out who "Mypepitas" is, hi, Annette! (two Anet/Annettes, neat.) Thanks, my fingers are crossed also. Want to bet he dumps Palin for Leiberman soon? So, by that logic we here in Maine are all foreign ambassadors because 2/3 of our border is with Canada? Cool! Are there any perks with that? Well, that's what I think, Heather (thanks for reading), I mean, I've dealt in a few trade missions with Oh Canada, myself. I've been around their foreign food, poutine and donair, (I haven't actually eaten any, it's foreign, ew!) and I actually sat in on Parliament...hey, wait, this might make me MORE qualified than Palin! We have already begun designing a website where we would like people to submit their pictures of politically themed pumpkins. We would lover permission to use your picture as a demo of what we're looking for. We'll be offering a prize of $270--one dollar for each of the electoral college votes Obama will need to win. This isn't for profit. It's really about doing a fun take on all the election craziness. If you wanted to see a mockup of what we're putting together, I could send you a picture of the website draft later today. Thanks for your time and we'd really love if we could use your photo! You can email me at pumpkinsforchange@gmail.com or stephaniewander@aol.com. Of course once we get some submissions, you can formally submit your pumpkin too.